An illustration of Euclid's proof of the Pythagorean theorem. Greek mathematics refers to mathematics texts and advances written in Greek, developed from the 7th century BC to the 4th century AD around the shores of the Eastern Mediterranean. Greek mathematicians lived in cities spread over the entire Eastern Mediterranean from Italy to North Africa but were united by culture and language. Greek mathematics of the period following Alexander the Great is sometimes called Hellenistic mathematics. The word "mathematics" itself derives from the Ancient Greek: μάθημα, translit. máthēma Attic Greek: [má.tʰɛː.ma] Koine Greek: [ˈma.θi.ma], meaning "subject of instruction". The study of mathematics for its own sake and the use of generalized mathematical theories and proofs is the key difference between Greek mathematics and those of preceding civilizations. The origin of Greek mathematics is not well documented. The earliest advanced civilizations in Greece and in Europe were the Minoan and later Mycenaean civilizations, both of which flourished during the 2nd millennium BC. While these civilizations possessed writing and were capable of advanced engineering, including four-story palaces with drainage and beehive tombs, they left behind no mathematical documents. Though no direct evidence is available, it is generally thought that the neighboring Babylonian and Egyptian civilizations had an influence on the younger Greek tradition. Between 800 BC and 600 BC, Greek mathematics generally lagged behind Greek literature,[clarification needed] and there is very little known about Greek mathematics from this period—nearly all of which was passed down through later authors, beginning in the mid-4th century BC. Historians traditionally place the beginning of Greek mathematics proper to the age of Thales of Miletus (ca. 624–548 BC). Little is known about the life and work of Thales, so little indeed that his date of birth and death are estimated from the eclipse of 585 BC, which probably occurred while he was in his prime. Despite this, it is generally agreed that Thales is the first of the seven wise men of Greece. The two earliest mathematical theorems, Thales' theorem and Intercept theorem are attributed to Thales. The former, which states that an angle inscribed in a semicircle is a right angle, may have been learned by Thales while in Babylon but tradition attributes to Thales a demonstration of the theorem. It is for this reason that Thales is often hailed as the father of the deductive organization of mathematics and as the first true mathematician. Thales is also thought to be the earliest known man in history to whom specific mathematical discoveries have been attributed. Although it is not known whether or not Thales was the one who introduced into mathematics the logical structure that is so ubiquitous today, it is known that within two hundred years of Thales the Greeks had introduced logical structure and the idea of proof into mathematics. Another important figure in the development of Greek mathematics is Pythagoras of Samos (ca. 580–500 BC). Like Thales, Pythagoras also traveled to Egypt and Babylon, then under the rule of Nebuchadnezzar, but settled in Croton, Magna Graecia. 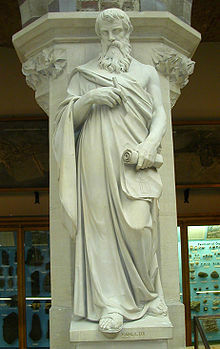 Pythagoras established an order called the Pythagoreans, which held knowledge and property in common and hence all of the discoveries by individual Pythagoreans were attributed to the order. And since in antiquity it was customary to give all credit to the master, Pythagoras himself was given credit for the discoveries made by his order. Aristotle for one refused to attribute anything specifically to Pythagoras as an individual and only discussed the work of the Pythagoreans as a group. One of the most important characteristics of the Pythagorean order was that it maintained that the pursuit of philosophical and mathematical studies was a moral basis for the conduct of life. Indeed, the words philosophy (love of wisdom) and mathematics (that which is learned) are said[by whom?] to have been coined by Pythagoras. From this love of knowledge came many achievements. It has been customarily said[by whom?] that the Pythagoreans discovered most of the material in the first two books of Euclid's Elements. Distinguishing the work of Thales and Pythagoras from that of later and earlier mathematicians is difficult since none of their original works survive, except for possibly the surviving "Thales-fragments", which are of disputed reliability. However many historians, such as Hans-Joachim Waschkies and Carl Boyer, have argued that much of the mathematical knowledge ascribed to Thales was developed later, particularly the aspects that rely on the concept of angles, while the use of general statements may have appeared earlier, such as those found on Greek legal texts inscribed on slabs. The reason it is not clear exactly what either Thales or Pythagoras actually did is that almost no contemporary documentation has survived. The only evidence comes from traditions recorded in works such as Proclus’ commentary on Euclid written centuries later. Some of these later works, such as Aristotle’s commentary on the Pythagoreans, are themselves only known from a few surviving fragments. Thales is supposed to have used geometry to solve problems such as calculating the height of pyramids based on the length of shadows, and the distance of ships from the shore. He is also credited by tradition with having made the first proof of two geometric theorems—the "Theorem of Thales" and the "Intercept theorem" described above. Pythagoras is widely credited with recognizing the mathematical basis of musical harmony and, according to Proclus' commentary on Euclid, he discovered the theory of proportionals and constructed regular solids. Some modern historians have questioned whether he really constructed all five regular solids, suggesting instead that it is more reasonable to assume that he constructed just three of them. Some ancient sources attribute the discovery of the Pythagorean theorem to Pythagoras, whereas others claim it was a proof for the theorem that he discovered. Modern historians believe that the principle itself was known to the Babylonians and likely imported from them. The Pythagoreans regarded numerology and geometry as fundamental to understanding the nature of the universe and therefore central to their philosophical and religious ideas. They are credited with numerous mathematical advances, such as the discovery of irrational numbers. Historians credit them with a major role in the development of Greek mathematics (particularly number theory and geometry) into a coherent logical system based on clear definitions and proven theorems that was considered to be a subject worthy of study in its own right, without regard to the practical applications that had been the primary concern of the Egyptians and Babylonians. The Hellenistic period began in the 4th century BC with Alexander the Great's conquest of the eastern Mediterranean, Egypt, Mesopotamia, the Iranian plateau, Central Asia, and parts of India, leading to the spread of the Greek language and culture across these areas. Greek became the language of scholarship throughout the Hellenistic world, and Greek mathematics merged with Egyptian and Babylonian mathematics to give rise to a Hellenistic mathematics. 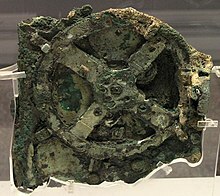 Greek mathematics and astronomy reached a rather advanced stage during the Hellenistic and Roman period, represented by scholars such as Hipparchus, Apollonius and Ptolemy, to the point of constructing simple analogue computers such as the Antikythera mechanism. The most important centre of learning during this period was Alexandria in Egypt, which attracted scholars from across the Hellenistic world, mostly Greek and Egyptian, but also Jewish, Persian, Phoenician and even Indian scholars. Most of the mathematical texts written in Greek have been found in Greece, Egypt, Asia Minor, Mesopotamia, and Sicily. Archimedes was able to use infinitesimals in a way that is similar to modern integral calculus. Using a technique dependent on a form of proof by contradiction he could give answers to problems to an arbitrary degree of accuracy, while specifying the limits within which the answer lay. This technique is known as the method of exhaustion, and he employed it to approximate the value of π (Pi). In The Quadrature of the Parabola, Archimedes proved that the area enclosed by a parabola and a straight line is 4/3 times the area of a triangle with equal base and height. He expressed the solution to the problem as an infinite geometric series, whose sum was 4/3. In The Sand Reckoner, Archimedes set out to calculate the number of grains of sand that the universe could contain. In doing so, he challenged the notion that the number of grains of sand was too large to be counted, devising his own counting scheme based on the myriad, which denoted 10,000. Greek mathematics constitutes a major period in the history of mathematics, fundamental in respect of geometry and the idea of formal proof. Greek mathematics also contributed importantly to ideas on number theory, mathematical analysis, applied mathematics, and, at times, approached close to integral calculus. Euclid, fl. 300 BC, collected the mathematical knowledge of his age in the Elements, a canon of geometry and elementary number theory for many centuries. The most characteristic product of Greek mathematics may be the theory of conic sections, largely developed in the Hellenistic period. The methods used made no explicit use of algebra, nor trigonometry. Eudoxus of Cnidus developed a theory of real numbers strikingly similar to the modern theory of the Dedekind cut developed by Richard Dedekind, who indeed acknowledged Eudoxus as inspiration. Syriac or Arabic translations of Greek works and Latin translations of the Arabic versions. Nevertheless, despite the lack of original manuscripts, the dates of Greek mathematics are more certain than the dates of surviving Babylonian or Egyptian sources because a large number of overlapping chronologies exist. Even so, many dates are uncertain; but the doubt is a matter of decades rather than centuries. ^ Heath (1931). "A Manual of Greek Mathematics". Nature. 128 (3235): 5. Bibcode:1931Natur.128..739T. doi:10.1038/128739a0. ^ a b Hodgkin, Luke (2005). "Greeks and origins". A History of Mathematics: From Mesopotamia to Modernity. Oxford University Press. ISBN 978-0-19-852937-8. ^ George G. Joseph (2000). The Crest of the Peacock, p. 7-8. Princeton University Press. ISBN 0-691-00659-8. ^ J J O'Connor and E F Robertson (April 1999). "Eudoxus of Cnidus". The MacTutor History of Mathematics archive. University of St. Andrews. Retrieved 18 April 2011. ^ J J O'Connor and E F Robertson (October 1999). "How do we know about Greek mathematics?". The MacTutor History of Mathematics archive. University of St. Andrews. Retrieved 18 April 2011.